Foreign buyers of homes in the Greater Golden Horseshoe make up only a small percentage of the market according to analysis by Toronto Real Estate Board. It found that the proportion of buyers between 2008 and April 2017 with a mailing address outside Canada was less than 1 per cent; most of those had a US address. The average share of foreign buyers during that 9-year period was 2.3 per cent and was 2.6 per cent in the first four months of 2017. Most (up to 90 per cent) of those bought their home to live in. TREB also looked at flipping and found that the share of total transactions which saw homes bought and sold within a year was 5 per cent for 2016 and 7 per cent for the first four months of 2017. The board has also released sales figures for the GTA for April 2017 showing a 3.2 per cent year-over-year decline to 11,630; although Easter was in April this year and March the year before. New listings were up 33.6 per cent year-over-year to 21,630 while the average selling price rose 24.5 per cent to $920,791. "The fact that we experienced extremely strong growth in new listings in April means that buyers benefitted from considerably more choice in the marketplace. 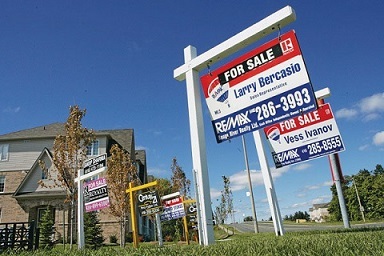 It is too early to tell whether the increase in new listings was simply due to households reacting to the strong double-digit price growth reported over the past year or if some of the increase was also a reaction to the Ontario Government's recently announced Fair Housing Plan," said TREB president Larry Cerqua.